How Do I Prevent Birds From Hitting My Window? You don’t have to be an ornithophile to feel awful when a bird has taken a kamikaze dive at your window. All of us have been in this situation. You’re reclined near your window on your sofa, engrossed in a novel or binge-watching a Netflix show, when you nearly jump out of your skin because it sounds like a planet just crash-landed into your house. When you go outside to investigate you find a lovely bird who has either perished from its fateful flight or is in the throes of death. For most of us this isn’t a common occurrence, but it can be prevented in areas where bird death-by-window is very frequent. 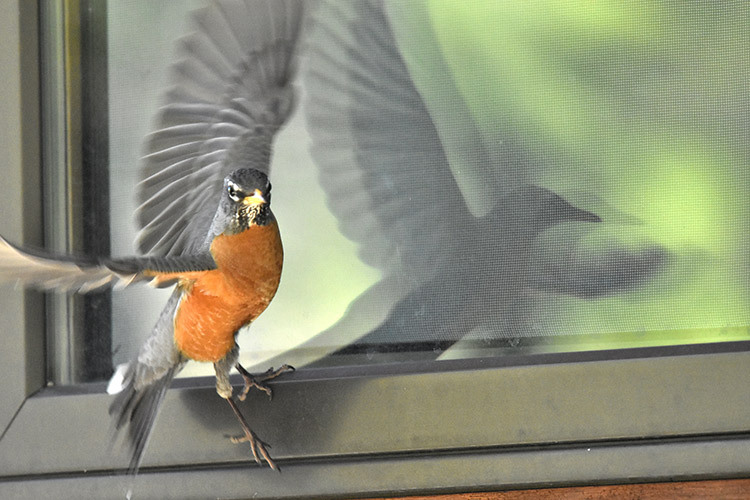 They fly into windows for the same reason why humans sometimes walk into the sliding glass door. While a human walking into a glass door is usually not a cause of major injury and is sometimes funny, the bird’s situation is usually fatal. They don’t understand the concept of a “window” and therefore perceive no barrier there. This is especially true if the window is very big, doesn’t have panes, and looks into a large, light-filled room. Windows are also highly reflective of trees and outside foliage, so the birds fly towards this mirage thinking they will find a nice place to rest or build a nest. Because of the reflection, a bird may see its own reflection as a rival bird and thus will “peck” the window to its own demise. Most methods are visible to humans and will change the appearance of your window. For windows that face the front, choose the methods that have the best curb appeal. Small decals can be effective – they come in pretty shapes and size and they come off easily. If you go with the decal, you must place them within a couple of inches of each other if they are to be effective. Don’t get decals of flowers, trees, or foliage – these will attract rather than deter birds. Apply the decals on the outside surface so that the window’s reflection is hidden. Some drawbacks to these decals – they are highly visible and they aren’t practical for extremely large windows. DIY warehouses now sell fake stained-glass window film designed to cover your window from corner to corner. These can be applied on the inside surface, as the birds will perceive “stained glass” as a barrier. Drawbacks to this method – they filter out some light and you won’t be able to see outside. While they can be removed, you won’t want to after paying good money for them. Buying one or two rolls won’t break the bank but if you have a large window, the quantity of film needed may cost hundreds. One-way film is applied to the outside surface of your window. From the outside, it creates an opaque, matte barrier where you cannot see into the home. However, people inside the house can see through the window. This can be an expensive project depending on the amount of coverage you need. It will also change the appearance from the outside. On the other hand, you can save a lot of money with energy costs as it filters out heat radiation. Sometimes, a bird will fly off on its own after hitting a window (although it may die from internal injuries or concussions later). If you find that the crash victim is flightless and injured, you can use this directory to find a wildlife rehab center. If you must wait to take the bird to get care, pick the bird up as gently as possible and place it on a cushioned surface in a box. Put a secure cover on the box making sure the cover will allow air flow into the box. Place the box in a room in your house where it won’t be bothered by other pets. Do not feed it and do not touch or pick it up again. It is against the law to handle migrating birds so make sure you get it to a trained wildlife facility as soon as you possibly can.